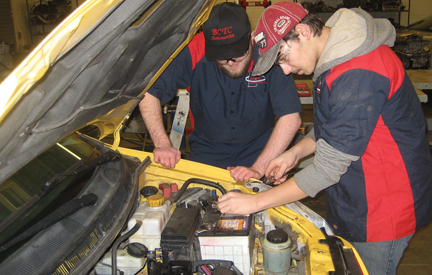 The Automotive Technology program provides students with theory and hands-on experience using the latest training and diagnostic equipment to learn trouble shooting and repair of all modern vehicles. This Program is a N.A.T.E.F. certified program, giving students enrolled the best training and preparation to complete their ASE certification. Through our program, employability skills, safety and work habits are stressed. The Automotive Technology program provides students with a system approach to all aspects of automobile and light truck maintenance and repair. Our goal is to provide graduates with a strong working knowledge of the automotive industry. This program places an emphasis on engine diagnostics/repair, engine performance, automotive electricity/electronics, steering, suspension and brake systems. Students can earn a PA State Inspection Certificate and Emissions inspection Certificate. National Occupational Competency Testing with Advanced Certification is administered upon completion of the course. Automotive Technician, Service Manager, Auto Diagnostician, Independent, Garage Owner, Automotive Salesperson, Auto Parts Manager. Students can earn advanced credits while attending the technical center. We have articulation agreements and early college opportunities for students enrolled in the Auto Technology Program.